When you’re retired, there are three major risks to making your savings last. The first is longevity risk. That’s the risk that you’re going to live longer than you thought and will also need your savings to last longer. The second is inflation risk. That is the risk that everything you want to buy in the future is going to get more expensive. The third is “sequence of returns” risk. This is the risk that your savings doesn’t provide the growth you need in retirement. Managing these different risks is critical to your success. There are a few different ways to manage longevity risk. The first, and most difficult, is to make sure you’ve got enough money to last until you’re very old. Exactly how old that is will depend on personal and family health histories as well as future medical advances. It’s not unheard of for younger people to be planning to live to 100 and beyond. The other way you can manage longevity risk is to plan on not being around very long. Taking up high risk activities like smoking, sky diving, and weaving in and out of traffic at high speeds on a motorcycle can all significantly increase the odds of you not living a long time. I don’t recommend any of those things, but they are options. Managing inflation risk can also be handled a couple of different ways. Again, the first and most difficult is to make sure you’ve got plenty of money set aside. How much is enough? Using the Rule of 72 as a rough measure, if inflation remains at current levels, you would expect that everything you buy will cost twice as much in about 36 years. If inflation rises to its historic average over the last 40 years, you might expect everything you buy to double in about 16 years. If inflation rises to levels we saw back in the late 70’s and early 80’s you could expect everything you buy to double every 7 years. Think about that. If everything were to double in price every 36 years and you’re 50, you might expect to see your standard of living double in price once. With inflation at 4% you could easily see everything you buy double twice. That’s twice as much as it costs now in 16 years, and twice as much again in 32 years. Clearly, inflation is a huge risk. Besides accumulating a whole lot of savings, the way most people try and manage the first two risks is by growing their savings. They do that by investing. Because very few people can accumulate enough savings to cover living expenses to age 100 that may double every 16 (or fewer) years, most people need their savings to grow. This need for growth forces them to assume investment risk and along with that, the third major risk to retirement, sequence of returns risk. Over long periods of time investing in “risky” assets has historically rewarded patient investors with nice rates of return, but it’s a bumpy road. Most of us still remember that bump in the road we hit back in 2008! How much exposure to stocks you had in your portfolio determined whether that was a sink or pot hole, and how long it took for your portfolio to return to pre-financial crisis levels. That’s a perfect example of sequence of returns risk. If you were unfortunate enough to have just recently retired in 2008, you probably saw a significant portion of your life savings go away with that downturn. Even though, over long periods of time, the average rate of return on a diversified investment portfolio looks good, when you get the returns is very important. Too big a loss, or too many years with low returns in the early years of drawing down your savings can mean that there’s not enough left in the portfolio to reap the benefits of future good years, leaving you with the possibility of running out of money before you run out of time. 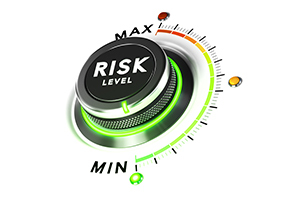 There are three ways to manage sequence of return risk. The first is establishing a safe withdrawal rate. That is an amount of money that history suggests you’d be able to take out of your investments every year that would survive a thirty-year retirement period, no matter what. The risk to that strategy is that you end up spending a lot less than you might have been able to, and instead of “golden” years, yours are kind of bronze-ish? The second would be a strategy where you adjust your investment mix, either dialing the exposure to stocks up or down depending on how much growth you need. The risk there is that you make the wrong adjustment and don’t get the growth you need. The third way to manage sequence of returns risk would be adjusting your spending, depending on how your portfolio is performing. Again, the risk with this strategy is that you over or under adjust. Understanding the unique risks of investing for retirement is the first step in helping you develop a plan to succeed. If you’d like some help, let me know.